What Is the History of Dengue Fever Outbreaks? What Causes Dengue Fever, and How Is Dengue Fever Transmitted? What Are Symptoms and Signs of Dengue Fever? How Long Is the Incubation Period for Dengue Fever, and How Long Does Dengue Fever Last? How Do Health Care Professionals Diagnose Dengue Fever? Are There Dengue Fever Home Remedies? What Are Dengue Fever Complications? What Is the Prognosis of Dengue Fever? How Can People Prevent Dengue Fever? Dengue fever is a disease caused by viruses that are transmitted to people by mosquitoes. 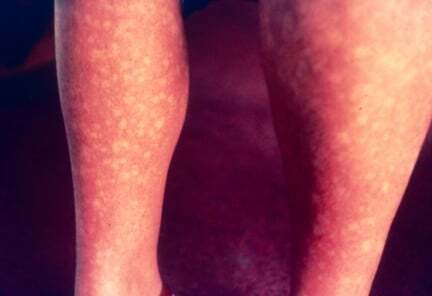 Dengue fever usually causes fever (high, about 104 F-105 F), skin rash (see Figure 1), and pain (headaches and often severe muscle and joint pains). The disease has also been termed "breakbone fever" or "dandy fever" because the unusually severe muscle and joint pains can make people assume distorted body positions or exaggerated walking movements in an effort to reduce their pain. Dengue fever is endemic in tropical and subtropical areas. Dengue fever is estimated by the World Health Organization (WHO) to cause about 50-100 million infections per year worldwide. 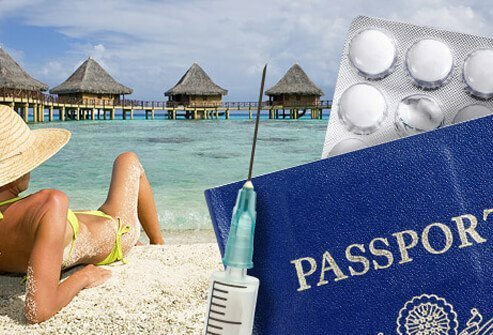 The U.S. Centers for Disease Control and Prevention (CDC) considers dengue fever to cause the majority of acute febrile illnesses in travelers returning to the U.S. The first clinical report of dengue fever was in 1789 by B. Rush, although the Chinese may have described the disease associated with "flying insects" as early as 420 AD. Africans described "ka dinga pepo" as cramp-like seizure caused by an evil spirit. The Spanish may have changed "dinga" to dengue since it means fastidious or careful in Spanish, which describes the gait of people trying to reduce the pain of walking. Dengue has spread widely throughout the world; the CDC distribution map (available at https://wwwnc.cdc.gov/travel/yellowbook/2018/infectious-diseases-related-to-travel/dengue) shows that dengue fever mainly occurs in tropical and subtropical areas. In the U.S., dengue fever has been detected in California, Florida, Texas, and Hawaii. Other areas where it has been detected or there has been an outbreak of the disease include the Philippines, Taiwan, Samoa, Brazil, Puerto Rico, Costa Rica, Thailand, and New Delhi. However, as climates warm, experts suggest dengue will become more prevalent. In 2015, an outbreak of dengue fever occurred in New Delhi, the worst in the previous five years. Over 10,000 people tested positive for dengue fever; there have been at least 32 deaths attributed to this outbreak. State-run hospitals were so overcrowded that patients were sharing beds. An independent group (Brandeis University) suggests the actual numbers of people in India with dengue are "vastly underreported." A 2017 outbreak of Dengue in Sri Lanka reports over 107,000 infections, with about 296 deaths over the last six months as of August 2017 and is considered an unprecidented outbreak. Flooding early in 2017 allowed the mosquito population to flourish and spread the disease and is thought to be a major factor contributing to this outbreak. Sri Lanka's hospitals are converting maternity and other wards to dengue wards, but many are running out of room to treat patients. Four closely related viruses cause dengue fever. The viruses are transmitted from Aedes aegypti and Aedes albopictus mosquitoes to humans in a viral life cycle that requires both humans and these mosquitoes. There is no human-to-human dengue fever transmission. Once a mosquito is infected, it remains infected for its life span. A human can infect mosquitoes when the human has a high number of viruses in the blood (right before symptoms develop). The viruses belong to the Flaviviridae family and have an RNA strand as its genetic makeup. Virologists term them dengue virus types 1-4 (DENV 1-4). All four serotypes are closely related. However, there are enough antigenic differences between them that if a person becomes immune to one serotype, the person can still be infected by the other three serotypes. The symptoms and signs for dengue begin about three to 15 days (incubation period) after a mosquito bite transfers a virus (dengue virus serotypes 1-4) to a person previously unexposed to the viruses. Fever and painful muscle, bone, and joint aches can occur during the first few hours of symptoms when headache, chills (shivering and/or sweating), rash (may be itchy) and/or red spots or flushing, and swollen lymph nodes first appear. Pain behind or in back of the eyes is also a common symptom. Some individuals may develop a sore throat, vomiting, nausea, abdominal and/or back pain, and loss of appetite. These symptoms usually last about two to four days and then diminish, only to reappear again with a rash that covers the body and spares the face. The rash also may occur on the palms of the hands and the bottom of the feet, areas frequently spared in many viral and bacterial infections. The symptoms may last about one to two weeks with complete recovery, in most cases, in a few weeks. However, some people can develop more severe symptoms and complications, such as hemorrhagic areas in the skin (easy bruising), gums, and the gastrointestinal tract. This condition is termed dengue hemorrhagic fever (DHF). The majority of DHF is seen in children under 15 years of age, but it can occur in adults. Another clinical variation of dengue fever is termed dengue shock syndrome (DSS); DHF usually precedes DSS. The patients eventually develop severe abdominal pain, heavy bleeding, and blood pressure drops; this syndrome, if not treated quickly, may cause death. Dengue fever is not contagious; it is not spread from person to person. Dengue fever viruses require a vector, a mosquito (see Causes section below), that allows the virus to mature within the mosquito before the mosquito can effectively transfer the viruses to humans during a blood meal. Symptoms of infection usually start about four to 15 days (the incubation period is typically four to seven days) after a mosquito bite transfers the viruses to the human. In most instances, the disease lasts about three to 10 days, although a few patients' symptoms may last longer. During the incubation period, large amounts of the virus are present in the person's blood just before the person becomes symptomatic; this is when a mosquito that may be uninfected can pick up viruses that can be transferred to other humans. However, the virus has to develop within the mosquito for a few days before it is ready to be transferred during the blood meal (mosquito bite). Dengue fever is presumptively diagnosed by a medical caregiver by the relatively characteristic sequence of high fever, rash appearance, and other symptoms in a person who has a history of recent travel to dengue endemic areas and recalls mosquito bites while in the endemic area. However, if not all of the symptoms are present or the history is not complete, the caregiver is likely to run a number of tests to obtain a definitive diagnosis. Other diseases may yield similar symptoms (for example, leptospirosis, typhoid fever, yellow fever, scarlet fever, Rocky Mountain spotted fever, meningococcemia, malaria, chikungunya, food poisoning, and several others). If the patient has severe symptoms; or if the medical caregiver does not have enough information to make a presumptive diagnosis, the patient is likely to undergo a number of other tests to definitively distinguish dengue fever from other diseases. In general, the more serious the symptoms such as easy bruising, fevers at or above 104 F, hemorrhages or shock syndrome, the more tests are likely to be done. In general, most physicians will order a complete blood test (CBC), with a metabolic panel, along with coagulation studies in most patients with high fever and any bleeding problems. Low platelet and low white cell counts may occur with the disease. In addition, depending on the symptoms (especially headache), blood and urine cultures plus a spinal tap may be done to help differentiate between dengue fever and other diseases. A MAC-ELISA assay (an immunoglobulin M-based test) is the most widely used test for dengue fever virus. However, other tests are available; they also are based on the person's immunological response to the dengue viruses (for example, IgG-ELISA, dengue viral plaque reduction tests, and PCR tests). These tests are considered definitive for exposure to dengue virus; definitive diagnosis of dengue fever is isolation and identification (usually by immunological tests) of the dengue virus serovar from the patient. Fortunately, this viral disease is usually self-limited and usually adequate hydration and pain control will help the person through the infection. However, for dengue fever, a caution is given by most doctors regarding home treatment. Nonsteroidal anti-inflammatory agents (for example, aspirin (Bayer, Ecotrin), ibuprofen (Motrin), and other NSAIDs) should be avoided because of the tendency of the dengue viruses to cause hemorrhages. The NSAIDs may add to the hemorrhage symptoms. Other medications such as acetaminophen (Tylenol), codeine, or other agents that are not NSAIDs may be used. More severe variations of dengue fever (hemorrhagic and shock syndrome) usually require additional supportive treatments; these patients often require hospitalization. IV fluid hydration, blood transfusions, platelet transfusions, blood pressure support, and other intensive care measures may need to be utilized in these patients. Consultation with infectious disease and critical care specialists is often advised to optimize patient care. Home care for dengue fever is simply supportive care. Good oral hydration, pain control with Tylenol (or other non-NSAIDs, because the NSAIDs may cause bleeding) is usually adequate treatment for most people. However, there is no role for home care in patients with dengue hemorrhagic fever or for dengue shock syndrome; depending on the patient's condition, many physicians consider these conditions to be medical emergencies. Papaya leaf extract has been used to help increase platelet levels in some patients with dengue fever, but researchers caution that definitive studies are not yet available that confirm the utility of this treatment. Patients should consult their doctors before using this remedy. For the large majority of people infected with dengue fever viruses, the prognosis is excellent with complete recovery, although they are likely to feel very ill during the first one or two weeks of the acute illness and weak for about one month. Patients with underlying illness or immune suppression have a fair to good prognosis because they are more likely to get complications. Also, people who have been infected by one dengue virus type are still able to be infected by the remaining three types; a second infection increases the possibility that complications will develop, so patients with second-time dengue fever have a less optimal prognosis. Patients who develop DHF or DSS have a range of outcomes from good to poor, depending on their underlying medical problems and how quickly supportive measures are given. For example, DHF and DSS have about 50% fatality rate if untreated but only about a 3% rate if treated with supportive measures. Overall, the fatality rate is about 1% for all dengue fever infections. While this rate may seem low, worldwide it means that about 500,000 to 1 million people die each year from dengue fever. This is a concern since the worldwide case numbers and outbreaks are increasing. Avoid outbreaks: To the extent possible, travelers should avoid known foci of epidemic disease transmission. The CDC Travelers' Health web page provides alerts and information on regional disease transmission patterns and outbreak alerts (http://www.cdc.gov/travel) or contact a travel medicine doctor (often an infectious-disease specialist). Be aware of peak exposure times and places: Exposure to arthropod bites may be reduced if travelers modify their patterns of activity or behavior. Although mosquitoes may bite at any time of day, peak biting activity for vectors of some diseases (for example, dengue, chikungunya) is during daylight hours. Vectors of other diseases (for example, malaria) are most active in twilight periods (for example, dawn and dusk) or in the evening after dark. Avoiding the outdoors or focusing preventive actions during peak hours may reduce risk. Place also matters; ticks are often found in grasses and other vegetated areas. Local health officials or guides may be able to point out areas with greater arthropod activity. Wear appropriate clothing: Travelers can minimize areas of exposed skin by wearing long-sleeved shirts, long pants, boots, and hats. Tucking in shirts and wearing socks and closed shoes instead of sandals may reduce risk. Repellents or insecticides such as permethrin (Elimite) can be applied to clothing and gear for added protection; this measure is discussed in detail below. Insecticides: Aerosol insecticides, vaporizing mats, and mosquito coils can help to clear rooms or areas of mosquitoes; however, some products available internationally may contain pesticides that are not registered in the U.S. Insecticides should always be used with caution, avoiding direct inhalation of spray or smoke. Optimum protection can be provided by applying repellents. The CDC recommends insect repellent should contain up to 50% DEET (N,N-diethyl-m-toluamide), which is the most effective mosquito repellent for adults and children over 2 months of age. There are no vaccines currently available commercially for dengue virus available in the U.S. However, Sanofi Pasteur has produced a dengue vaccine, Dengvaxia, designed to work against all four types of the virus. Unfortunately, it is only about 60% effective and approved for use in those 9-45 years of age who live in dengue-endemic areas. In addition, the CDC suggests that the vaccine is less effective against dengue virus types 1 and 2. Three countries have approved the vaccine for use: Mexico, Philippines, and Brazil. The vaccine has not been approved by the FDA for use in the U.S. There are about five other companies evaluating clinical trials of dengue virus vaccines. Normal body temperature can vary depending on the individual, the time of day, and even the weather. For most people, a temperature of 98.6 F (Fahrenheit) (37 C or Celsius) is baseline. Fever occurs when the body's immune response is triggered by pyrogens (fever-producing substances). Dejnirattisai, W., A. Jumnainsong, N. Onsirisakul, et al. "Cross-Reacting Antibodies Enhance Dengue Virus Infection in Humans." Science 328 (2010): 745-748. United States. Centers for Disease Control and Prevention. "Dengue." Jan. 19, 2016. <http://www.cdc.gov/dengue/index.html>. Wilder-Smith, A., L. Chen, E. Massad, and M. Wilson. "Threat of Dengue to Blood Safety in Dengue-Endemic Countries." Emerg. Infect Dis. 15.1 (2009): 8-11. What was the treatment for your dengue fever? How was your dengue fever diagnosed? What were the symptoms of your dengue fever? Did you experience a rash? What dengue fever prevention steps did you take?